New Orleans, Louisiana’s sons of Southern grindcore Soilent Green have recorded the opening theme song to “Squidbillies”, an animated television series about a family of anthropomorphic hillbilly squids — the Cuyler family — that lives in indigence in the Appalachian region of North Georgia’s mountains. The show’s fourth season kicked off on May 17 on Adult Swim. Vocalist Ben Falgoust comments: “‘Squidbillies’ is the best cartoon…excuse me…show on TV/Internet/cable around! I felt that way before we did the theme tracks, and I feel even stronger about it since I’ve seen the new episodes, despite our involvement with the program, of course. 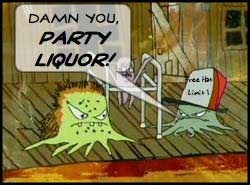 New episodes of “Squidbillies” air Sunday nights at midnight.